Replacing an existing home is considered DEVELOPMENT under the Conservation Authorities Act and a permit will be required if the project is proposed within a regulated area. 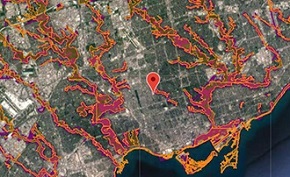 Many properties within TRCA’s jurisdication were developed in areas of natural hazards, along the shoreline or within wetlands prior to the introduction of TRCA’s Regulation. Redevelopment of these properties represent an opportunity to reduce the risk to life and property due to flooding, or to relocate buildings and structures away from sensitive natural areas, while allowing for moderate expansion where permitted under TRCA’s policies. Under Ontario Regulation 166/06, the TRCA regulates and may prohibit work from taking place within valley and stream corridors, wetlands and associated areas of interference and the Lake Ontario waterfront. If your property is regulated, you must apply for a permit from TRCA prior to carrying out any redevelopment. Replacing the existing development on a property is considered development under the Conservation Authorities Act. Limit of any other natural features including wetlands, limit of vegetation and/or floodplain elevations. Existing and Proposed development and dimensions. Setback dimension from the top of slope (or stable top of slope where applicable) to the proposed development (if applicable). The base permit fee is $820 or $1,850 ($1,640 or $3,700 if the property is located in a Special Policy Area) as per the TRCA Permit Fee Schedule. The fee includes a site visit if applicable. Fees may be higher if the project is complex. Payment can be provided via personal cheque made payable to TRCA or by providing credit card information on the application form.